For the third time in the last four months, Prosser experienced a record warm month in October. The main difference, however, was that last month's temperatures were even warmer, relative to normal, than July and August. This October's mean temperature represents the largest absolute (positive or negative) departure from normal for any month since January of 2010. October 2014's monthly average high, low, and mean temperatures all shattered the old October records for warmth. The mean monthly low (45.0 degrees) was an incredible 2.2 degrees higher than the previous record year (2003). 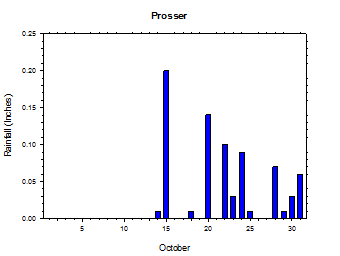 In fact, only 8 of the previous 25 Octobers at Prosser had a mean low that was above 40 degrees! It is worth noting that October is typically one of the least variable calendar months from year to year, which makes this data more unusual than even these surprising statistics would indicate. 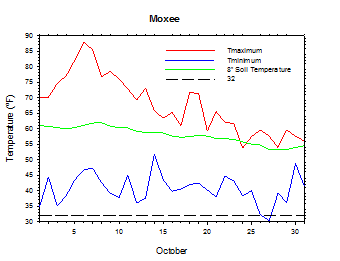 Moxee's mean October low was nearly 11 degrees warmer than last year. Amazingly, Mt. 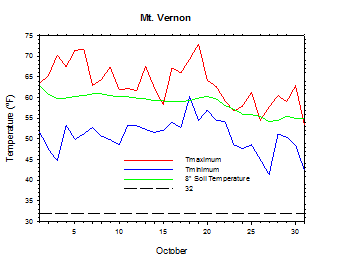 Vernon's mean low for October 2014 was actually slightly warmer than their normal October mean temperature, and also nearly 2 degrees warmer than their normal September mean low temperature. Overall, the monthly temperatures were almost 3 standard deviations above normal (standard anomaly = 2.9), which puts it near the 99th percentile for October. Early month daytime heat was one major reason for the abnormal warmth. Numerous monthly record highs were set on the 6th, including 89 degrees at Wenatchee and 86 degrees at Moses Lake. Prosser's high of 89 degrees surpassed the old October record by more than 5 degrees! 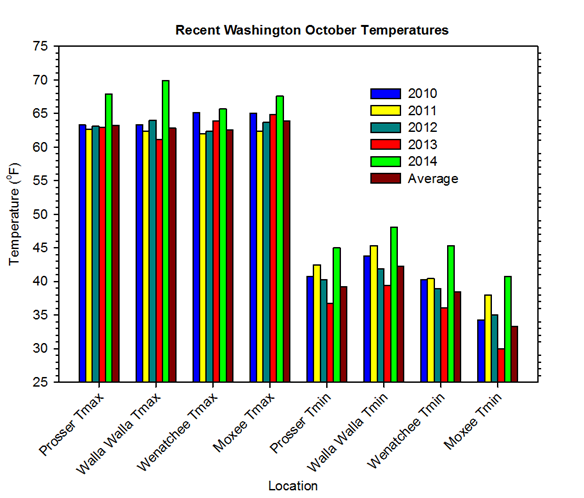 Temperatures, however, were only one piece of the unique October 2014 narrative. October was an all or nothing month with regard to storms and precipitation. 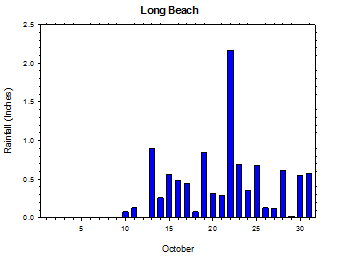 For example, Long Beach was rain free for the first 8 days of October, and then recorded rain on 22 of the final 23 days of the month. Following dry and somewhat calm weather early on, conditions became unsettled and at times breezy for much of the middle to latter portion of the month. Periodic heavy rain, especially during the final ten days of October, amounted to big monthly totals in western areas, including a robust 10.85 inches at Stevenson. A wet weather system containing subtropical moisture dumped 2.27 inches of rain at Stevenson on October 22nd. Another potent storm on the 25th brought 1.1 inches of rain to Tokeland, along with a 59 mph wind gust to Huntsville. Highs in eastern border areas dropped from around 70 degrees on the 25th to around 50 degrees on the 26th, as a few inches of snow fell in the Cascade high country. The low temperature at Davenport dipped to 27 degrees on the 27th during one of the few cool mornings of the month. High temperatures decreased as a result of the mid month pattern change. However, the normal highs drop significantly during October as well, and the associated cooling was not sufficient to balance the early heat. More importantly, low temperatures showed very little trend during the month, and were well above normal by late October. Thus, the combination of the early heat wave and the mid to late month mild nights made October another month for the record books. The 3rd was a cold morning, as Pullman fell to 29 degrees, although sunshine allowed for a large day-time temperature recovery. Highs reached the mid 60s to 70s, with 80 degrees at Montesano. Highs on the 5th climbed into the 70s and 80s, with 87 degrees recorded at Maryhill. Lows were in the upper 30s to low 60s. The 6th was a sunny and very warm day. Some places in central Washington observed October record high temperatures, including 91 degrees at Tri-Cities and 89 degrees at Wenatchee and Prosser, as well as 86 degrees at Moses Lake. Mabton East climbed to an incredible 92 degrees! Overall, central areas reached the 80s to low 90s, while upper 70s occurred in eastern border areas, with 70s to low 80s in the west. Lows were in the 40s to mid 60s. Highs on the 7th reached the upper 70s to 80s east of the Cascades, and 60s to mid 70s in the west, except 82 degrees at Vancouver. 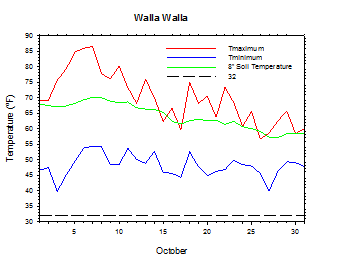 Lows ranged from the mid 40s to mid 60s, except 69 degrees at Wahluke Slope. Aside from a marine layer in the parts of the west, it was mainly sunny. Highs on the 13th reached the mid 60s to mid 70s in the west, and mid 60s to 70s east of the Cascades. Lows were in the upper 30s to mid 50s. More than 1 inch of rain fell at some sites in northwestern Washington. It was cloudy, breezy, and mild on the morning of the 14th. Highs on October 14th reached the upper 50s to low 70s, with lows in the upper 40s to mid 50s. Rain fell in many western areas, and also some locations east of the Cascades, with 0.57 inches measured at Underwood. The eastern border areas experienced breezy southerly winds. Highs on the 17th reached the 50s and 60s, with lows in the upper 30s to 50s. Rain fell in western and some central areas, including 0.46 inches at Long Beach. Highs on the 20th climbed into the low to mid 60s in the west, with a range of temperatures in the east that varied from the mid 50s in parts of central Washington to the mid 70s in southeastern areas. Lows were in the mid 30s to low 50s in the east, and 50s in the west. Rain fell in many western and central areas, with more than 1 inch recorded in parts of Whatcom County. Heavy rain fell in especially the southern half of western Washington on October 22nd, including 2.27 inches at Stevenson. Rain also fell in north central Washington, including 0.83 inches at Almira. Breezy southerly winds were observed in eastern areas, as subtropical moisture streamed into the state. Highs on the 23rd reached the 50s and 60s. Lows were in the upper 30s to low 50s. Light rain fell across much of the state, with heavier totals including 1.46 inches at Stevenson, and 0.53 inches at Fairfield. A potent low approached from the south on the 24th, and moved inland on the 25th, bringing wind, rain, and eventually cooler temperatures. Highs on the 25th climbed into the upper 60s to low 70s in some eastern border areas, while western and central areas topped out in the mid 50s to mid 60s. Lows were mainly in the 40s to low 50s. Rain fell in western areas, with 1.1 inches recorded at Tokeland. The wind at Huntsville gusted to 59 mph. Highs on the 31st reached the upper 40s to low 60s, and lows were in the 40s to low 50s. 1.2 inches of rain fell at Vancouver, with around one inch in areas north of Seattle. 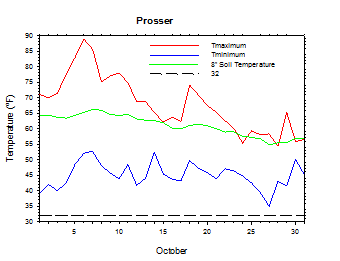 The average October temperature at Prosser (WSU IAREC) was 56.0°F, which is 5.3 degrees above average. The average high temperature was 67.9°F, which is 4.7 degrees above average. The average low temperature was 45.0°F, which is 5.8 degrees above average. The maximum temperature recorded last month was 88.9°F on October 6th, while the coolest daily high was 54.3°F on October 28th. 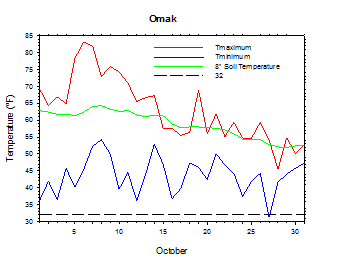 Low temperatures ranged from 52.7°F on October 7th to 34.9°F on October 27th. Daily average temperatures ranged from 68.0°F on the 7th to 45.6°F on the 27th. The monthly precipitation total was 0.76 inches. 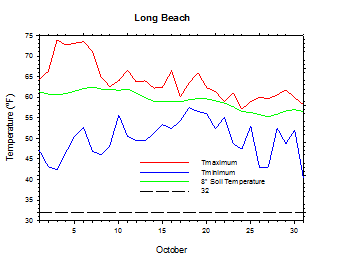 The average wind speed was 3.7 mph, and the average 8 inch soil temperature was 61.1°F. 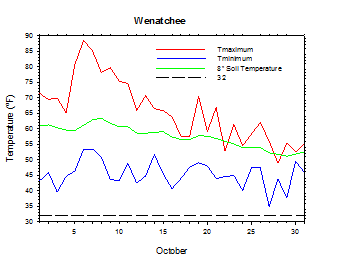 Wenatchee (WSU TFREC) recorded an average temperature of 55.1°F, which is 5.4 degrees above average, while Walla Walla's average monthly temperature of 57.9°F was 5.9 degrees above average. 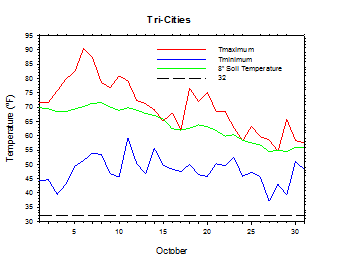 Pullman was one of the cooler spots in eastern Washington, with an average October temperature of 52.3°F. In western Washington, Mt. Vernon's average temperature was 56.8°F, which is 6.1 degrees above average. October 3rd: The temperature at LaCrosse plunged to 29 degrees. October 13th: 1.06 inches of rain fell at Sakuma. October 22nd: 2.27 inches of rain fell at Stevenson. October 25th: The wind at Huntsville gusted to 59 mph. October 26th: The low temperature at Davenport fell to 27 degrees. As of October 20th, harvest was nearing completion for crops like grapes, pumpkin, and onion, while additional soil moisture was still needed for winter wheat in southeastern areas of Washington. As of October 27th, a very large apple harvest was winding down, while rain was welcomed by dryland wheat growers in the east. Otherwise, no adverse weather conditions were reported to have had any negative impacts on crops (National Agricultural Statistics Service). 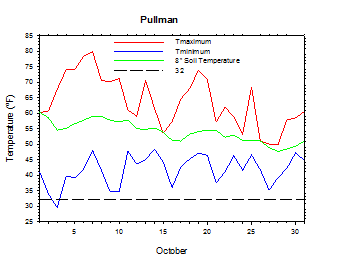 On October 5th, 2012, the low temperature at Pullman plunged to a chilly 18 degrees. According to the Climate Prediction Center, above normal temperatures and near to above normal precipitation are expected in November. Thereafter, above normal temperatures and below normal precipitation are expected well into 2015, as El Niño continues to develop.